The southern suburbs of Minneapolis offer a wide variety of both recreational and metropolitan living. Lakeville MN offers all this within the open areas of farmland. Started in 1853, Lakeville has grown to a major metropolis with a population of over 55,772 people. Located just 30-40 minutes south of the Twin Cities metro area, the city is fast becoming one of the most popular areas for families to settle down and raise their children. This growing population is due in part to the amazing 1000 companies located in Lakeville. The city also has recently enacted numerous public programs. Add to that the fact that Lakeville was named one of the top 100 (ranked 26) places to live by Money Magazine. So now that you have found your perfect home here, you need to find the perfect home inspector to help uncover the defects and concerns. I am a certified Minnesota home inspector through InterNachi. I am dedicated to providing professionalism and integrity to every home inspection. I am an independent home inspector which means I will give nothing less than the facts about your home. With over a decade of experience covering home inspections, real estate, remodeling, construction and defect recognition technology, you will get the very best in home inspections available. 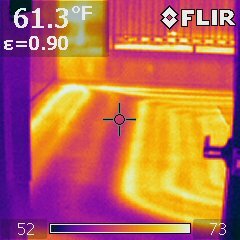 I use Thermal Infrared imaging with every Lakeville home inspection I perform. Continuously training and investing in the latest technology means you will benefit from all my hard work. Call 7 County Home Inspection, LLC for a complete detail of what we provide and to schedule your next home inspection.